Dodgers Blue Heaven: Blog Kiosk: 10/9/2014 - Dodger Links - Should Ned Stay or Should He Go? Blog Kiosk: 10/9/2014 - Dodger Links - Should Ned Stay or Should He Go? 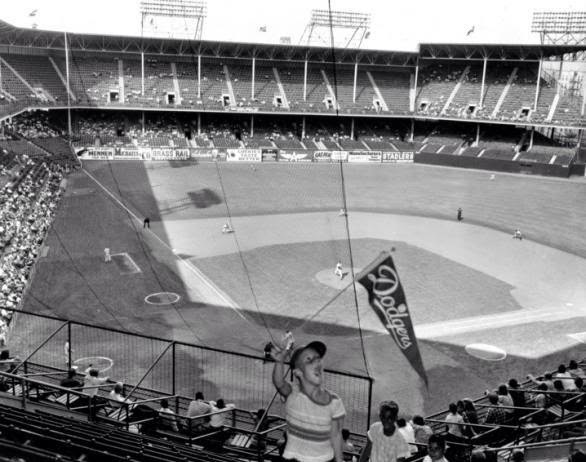 Above is a great vintage photo from the very last Dodger game at Ebbets Field in 1957, via @Dodgers_History on twitter. You should give them a follow for more great photographs. Via Eric Stephen at True Blue LA, "Ned Colletti reportedly on hot seat after early Dodgers demise." With an early exit in the playoffs come the obvious questions for the Dodgers, namely who - if anyone - will take the fall for losing one round earlier than in 2013? With offseason meetings beginning this week, the answer seems to lean more toward general manager Ned Colletti than manager Don Mattingly. In my own view, the makeup of the bullpen and Don's mistrust in it is the real culprit of this postseason loss, and that's purely the domain of Ned Colletti. He built it, he paid for it and his over-reliance on ineffective veterans ultimately became our downfall. If anyone goes to the chopping block it is likely to be him. MLB reporter Ken Rosenthal was on Beast980 KFWB to talk about Colletti, as well. Check that out here. I know the Elbert move, in Game 3, was controversial and it should have been. He put a guy in a situation that he hadn’t been in before, but why did that happen? It happened becasue his options were so limited. Why did Kershaw not come out when he gave up a baserunner in the 7th [in Game 4]? Because there was no one that Mattingly could trust in the bullpen. Via Sports Illustrated, "Report: Dodger Stadium could be next home for NFL team in LA." Jon Weisman at Dodger Insider writes about Jose Lime - LIMA TIME! Today is the 10th anniversary of his 2004 NLDS shutout of the Cardinals. Stay tuned! Jon also tells us that the episode of 'Lab Rats' on DisneyXD guest staring Andre Ethier will air this coming Monday at 6:15 PM. He also mentions that Don Newcombe's stepson is the co-creator and executive producer of the show. I miss you Baseball. I also hate you Baseball. Via Joe Frisaro at MLB.com, "Lasorda receives Bob Feller Act of Valor Award." What a bunch of A-Holes! Via David Brown at Big League Stew, the Yogi Berra Museum has been burglarized. Hopefully a detailed list of stolen items will be made available soon, so that the greater collecting community can keep an eye out.